Kodak Disc 4000, the best Christmas gift ever in 1983. I first received the Kodak Disc 4000 camera from Santa on Christmas Day of 1983. When you're a child, there's nothing like receiving your very first camera as a child. 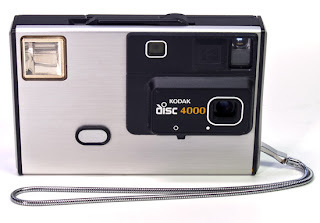 I loved the Kodak Disc 4000 camera! It was so stylish, slick and silver. The Kodak Disc film was cool looking even though it was overpriced and only allowed you to take 15 photos at a time. It's so depressing how my very first favorite camera was made by a company that recently announced it will no longer create cameras. I'm sorry, I'm just not good with change. Sometimes I wish life was as simple as asking for, and receiving a Kodak Disc 4000 camera. I had one of those! It was awesome! I wonder if you could dig one up on Craig's List or at a specialized camera shop (where they'd know someone that might have older collections). That was my 2nd camera. I think it's still up in my closet somewhere. My first camera was a 126 cartridge camera that my older sister and I shared for about 2 years until she got a disc camera when she turned 10. We would do "modeling shoots" out in our back yard with that 126. I got my own disc camera on my 10th birthday as well and used it until I bought my own 35mm when I was 17 or 18. A camera is an awesome thing for a kid to have and now they have kid-safe digitals so parents can give them to little kids and not have to worry about paying to develop a whole roll of blurry, too close pictures of the dog. There are a lot of Kodak Disc Cameras on eBay! You should check it out, they are super cheap too!! I totally agree with you about getting your first camera. Mine was a Kodak 110. I still remember how excited I was to receive that. I am certain my mother spent a fortune developing the film and so on too. Digitals changed everything! I'd love to buy one on eBay, the only problem is, Kodak stopped making the film back in like 1999. When you need it bad, we've got it good! Florida!